In 1984, map-maker Eugene M. Scheel created and published a map of Madison County that cites numerous historical locations. The map was based on Eugene Scheel's extensive research and interviews with numerous old-time Madison residents with direct knowledge of its history. 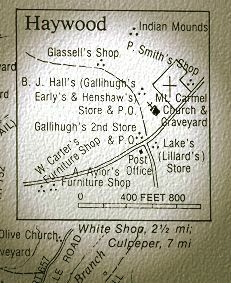 Scheel's map includes a special section on the Haywood area where Aylor lived. That section of the map is reproduced above showing B.J. Hall's store/Post Office, Gallehugh's Second Store/Post Office, Aylor's Furniture Shop, Mt. Carmel Church, and other early Haywood area landmarks. .We are in the process of collecting copies of old photos of the Haywood area and surrounding properties. Here are some of the photos we have found so far. If anyone can add to this collection, please contact us at 540-923-5012 or e-mail us at AylorProject@child2000.org. We will arrange to make copies so you can keep your originals. This undated photo shows the front and side of Haywood's General Store/Post Office - the so-called "Gallehugh's 2nd Store". It existed at the northwest corner of "Old Route 603" and Route 609 from about 1930 to the mid-1940s when it burned. Visible are chicken coops leaning on the side and an old gas pump located on the left beyond the porch. Above is an enhanced close-up of the sign from the photograph clearly showing "Post Office, Haywood, VA."
A view of the second Mt. Carmel Baptist Church that existed during the time Albert Aylor lived at the "Home Place." This second church was built in 1895. 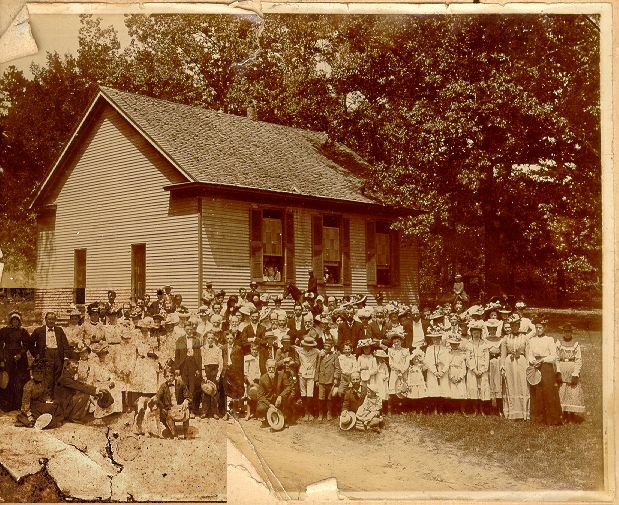 Most of the Aylor family, including Albert Aylor and his children and nearby relatives, attended both the first and this second church located on property abutting Albert Aylor's "Home Place." Albert Aylor and other family members are buried in the Mt. Carmel Church's cemetery. This wooden church building was replaced by the current brick church (funded by Frank Armstrong) in the 1950s.